Elected colour of 2019, Coral is both bright and soft. 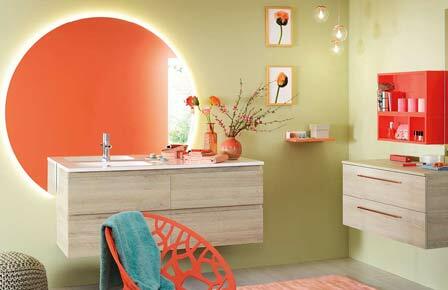 Perfect for your bathroom, you can apply small touches of decoration, or choose coral furniture. To celebrate the arrival of Spring, our Sanijura stylists were inspired by Coral and created a bathroom full of nature and brightness. Top note of this spring atmosphere, Coral mixes perfectly with a wide range of shades, going from powdered pink to dark red. In this atmosphere, you won’t need huge resources to transform your bathroom into a flowery cocoon. You can opt for linen that goes from light pink to orange, it’s easy to find and to stage. To dress your walls, find some pretty frames inspired by nature. Flowers, birds or insects, hang them in duos, trios or by 4 for those who love maximalism. For a more long-term decoration, why not apply some wallpaper on one of your wall-surfaces. Concerning storage, you can choose to install one or several lacquered wall units. Sanijura offers the Wally wall units lacquered in Capucine. They are easy to integrate, even in small spaces. Finally, make the most of the spring season and choose a pretty flower bouquet made of tulips and buttercups. For those who prefer flowers that aren’t cut, you can choose one or two plants that you can place in Coral flowerpots. For a nice spring atmosphere, you can associate Coral to cold tones such as blue or green. In a nature and relaxing spirit, the shades of green will have to stay soft and tender: almond green, pale green or mint green. Forget about bright or dark green, that would overload your room’s atmosphere and make the Coral be completely side-lined. For a trendier and brighter atmosphere, why not go for shades of blue: mint blue, turquoise blue or peacock blue. As well as green, it must stay discreet, to bring touches of contrast to your Coral theme. Do you know the Eurasian bullfinch? This bird loves to visit gardens and appreciates regions that are rich in orchards. Discreet and calm, he nests in hedges, away from vegetation. The male Eurasian bullfinch is draped in a bright orange chest and silvery blue feathers to seduce his lady. 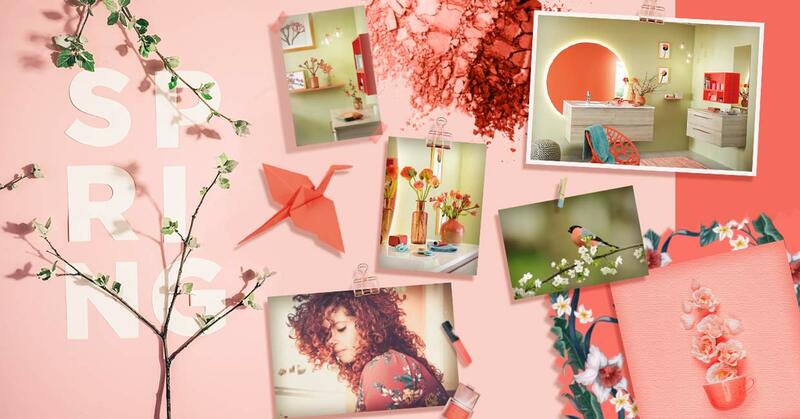 For the arrival of Spring, our stylists were inspired by Coral to create a flowery, colourful bathroom. Discover our Lumen furniture, Sanijura’s XXL range. 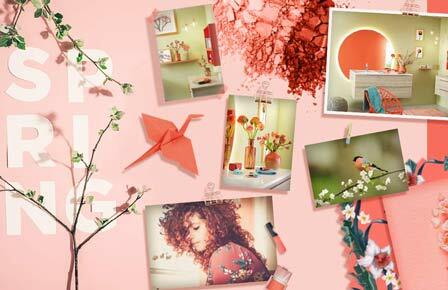 Elected colour of the year, Coral reinvents itself in the house. 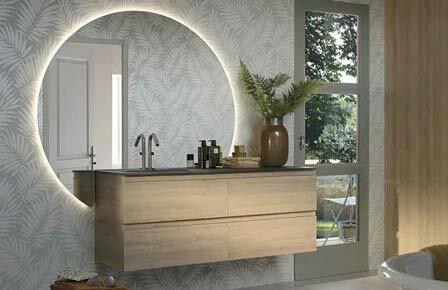 Discover our decoration tips to create a spring atmosphere in your bathroom.